FINALLY Sharing My Little Valentine's Day Secret! I'm super excited to share that we are finally expecting! 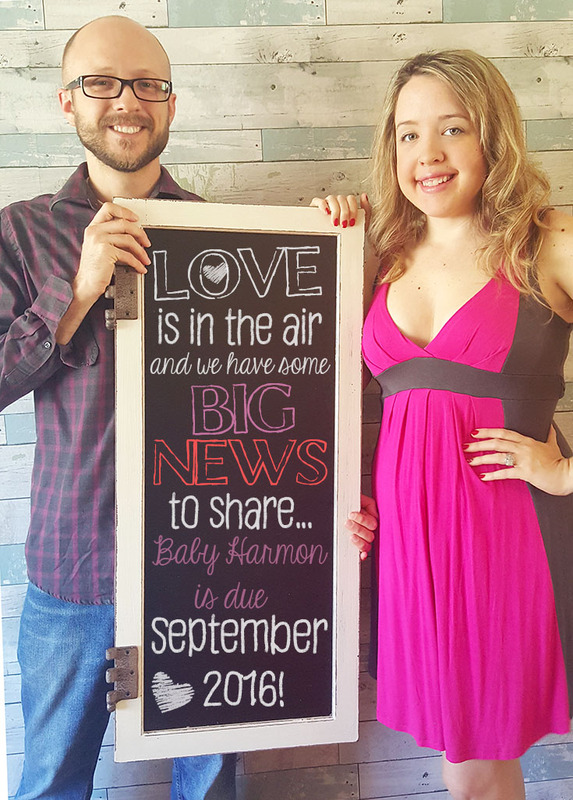 Little Baby Harmon is due in September 2016 and both my husband and I are thrilled! 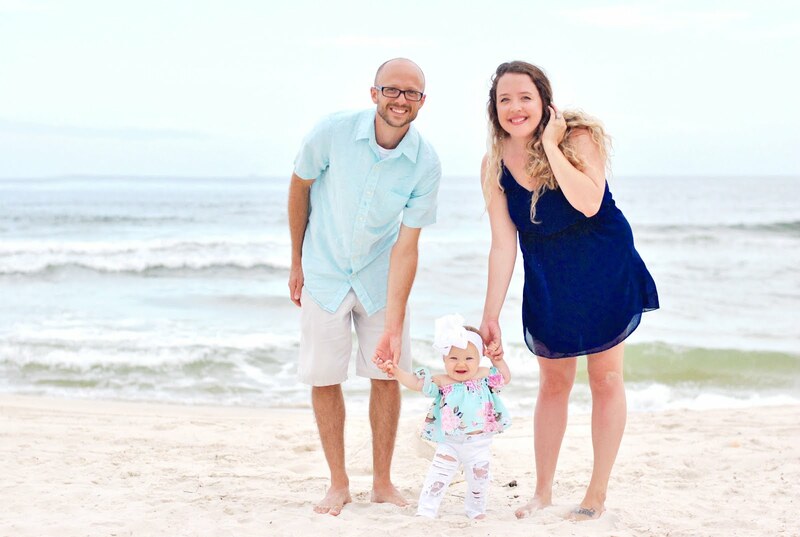 We went home earlier this month to share our news with our family and some close family friends but I wanted to make things official and share on our blog... if I could, I'd probably shout it from a mountain top as well. I'm that excited! If you've been following the blog recently, you may have read that we have been longing to have a little one... So as you would expect, I'm super excited to share our journey into parenthood with you! 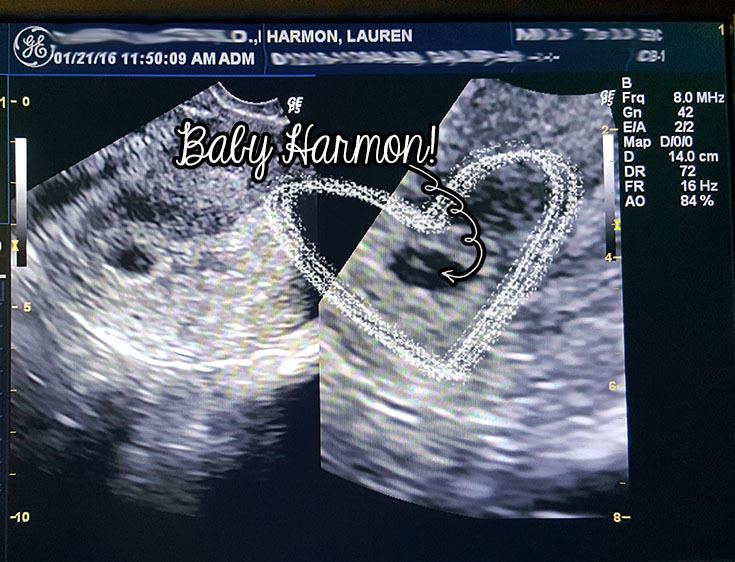 Speaking of sharing, here's our first ultrasound from when we first found out in January! Other than a sonogram photo of our baby from a few weeks I go, I'm not sure what to share as of yet... We're going to see the doc again tomorrow so I'll have a better update soon! For now I'll start with a little bit about the pregnancy so far: I've been SO sick, it's insane. 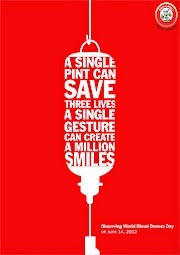 Morning, afternoon, and evening sickness almost every day, but it'll totally be worth it! When I'm not feeling sick, I'm craving foods that satisfy my sweet tooth and oddly, mashed potatoes are a normal craving as well! My spicy food craze that I've had my entire life has come to a screeching halt and I'm suddenly craving less seasoning and meals toddlers would enjoy like chicken tenders and mac & cheese! Beyond my sickness and cravings, we're super excited to find out if we are having a boy or a girl, as most couples are in the early months of pregnancy! While we're imagining whether we'll be buying little bows and pearls or tiny little toy cars and water guns, we're also starting to pick out names, nursery themes, and all the fun stuff we think we may want to add to the baby registry! As you can tell, we're both just a little overjoyed! So, if you have any excellent parenting advice, tips for items we must have as new parents, or you just want to share some exciting news with me, I'd love to hear about it in the comments below! OH & by the way, Happy Valentine's Day! It's an especially happy holiday in our house this year!